National Geographic Children's Books, 9781426332814, 352pp. It's the 10th anniversary of the world's best-selling almanac for kids! This year the Almanac features all-new content, interviews with explorers in each chapter, a special look at what was going on in the world when the first National Geographic Kids Almanac came out 10 years ago, plus the results of the 2019 Almanac Challenge and a new Challenge for kids who want to get involved with helping our planet. 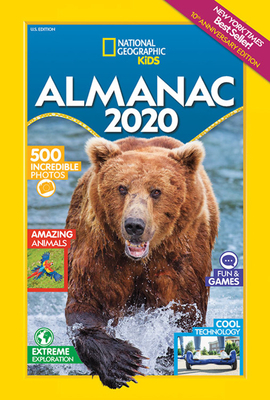 Kids can have fun keeping up with our quickly changing world with the New York Times best-selling almanac, packed with incredible photos, tons of fun facts, crafts, activities, and fascinating features about animals, science, nature, technology, conservation, and more. There's a whole chapter full of fun and games, including activities, jokes, and comics. Practical reference material, including fast facts and maps of every country, has been fully updated. Homework help on key topics is sprinkled throughout the book. Based on content from the award-winning and top-selling children's magazine, National Geographic Kids, and National Geographic Kids books, the almanac is created by multiple National Geographic contributors--including researchers, photographers, content experts, and educational specialists.